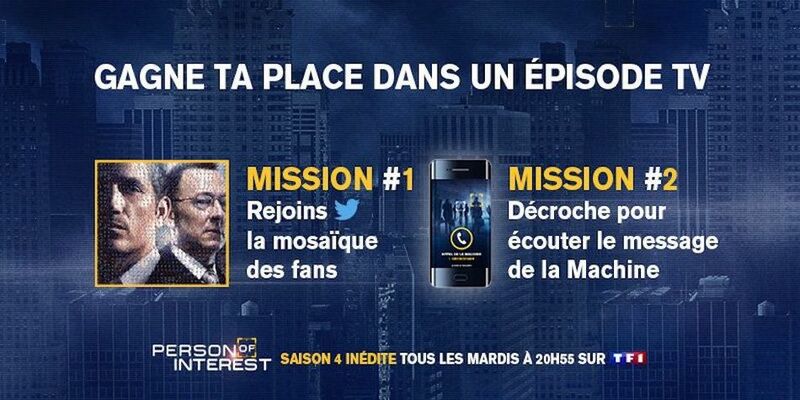 Last year, in 2015, TF1 initiated the comprehensive cross-platform sweepstakes campaign #POIcall, which aimed at promoting the final season three episodes of the crime drama series Person of Interest. In 2016, TF1 reintroduced the campaign to promote the season four premiere on January 5, 2016. This time fans are asked to fulfill two different missions, one on Twitter and one on MYTF1.fr, for the chance to be featured in one of the upcoming episodes and win series-related prizes. The first mission asks Twitter users to retweet a tweet by @lesseriesTF1. From January 4-17, fans have the chance to do so in order to have their profile photo integrated in a “Person of Interest” mosaic. Users then receive the completed mosaic in an @reply on Twitter along with the message that they have joined the #POIcall team. Additionally, the mosaic image with all user photos is used as the cover image of the official @lesseriesTF1 Twitter account. After the sweepstakes period ends on January 17, TF1 will select one winner whose photo will appear ahead of one of the season four on-air episodes. Runner-up winners will receive other series-related prizes such as books or BluRays. The second mission takes place during the same time period on TF1.fr and builds on an important element of the series: The Machine, a mass surveillance system that helps some of the series’ characters with their crime investigations by sending out coded messages to their phones. Fans are now asked to answer a call from The Machine on TF1.fr and decipher the audio message, which uses the NATO phonetic alphabet. In mid-December 2015, USA Network launched the Twitter-based promotional campaign #ColonyCode, encouraging fans to retweet a video in order to receive a code which could be used to watch the first episode of Colony ahead of its January 14 premiere. The show’s official Twitter account released several videos starring the show’s cast and crew members such as Josh Holloway or Sarah Wayne Callies. Viewers were called upon to retweet the message for the chance to receive an exclusive code to watch the Colony pilot. Fans who did so received an e-mail that contained the code and a link to the Colony early access website. Additionally, users received their code in an @reply on Twitter. At ColonyTV.com/EarlyAccess users then had to enter their e-mail and the corresponding code in order to be able to watch the pilot. Leading up to the premiere of its upcoming fantasy series Shadowhunters on January 12, 2016, ABC Family, which is changing its name to Freeform this January, launched an augmented reality app that invites fans to take part in a series-themed scavenger hunt. By scanning targets on various marketing elements, such as billboards or ads, fans can unlock exclusive digital content. Titled Shadowhunters: Join the Hunt’, the free app was released for iOS and Android devices on December 11, 2015. After downloading and installing the app and going through a tutorial, users have access to a list of augmented reality challenges – Hunts – that they have to complete in order to unlock exclusive content. By tapping on a Hunt, users get access to more detailed information. Users are asked to scan elements on Shadowhunters marketing elements such as billboards, posters, magazine ads and digital promotions. To scan an object, users simply need to click the Begin the Hunt button or the Use the Sight button at the bottom of the screen. Selecting either one of the buttons opens a scanner to target the marketing elements. Once a Hunt is completed, users are rewarded with 3D models of the revealed items. Fans then have the option to take augmented reality photos with the previously unlocked items, which can be moved, resized and rotated. The images can be shared across all common social media platforms and messaging services. All unlocked items can be accessed within the app’s Collection section. Moreover, users receive coins for each completed Hunt. The coins can be redeemed in the embedded store for additional rewards. Users are also encouraged to accept the app’s push notifications since new Hunts become available each week.